Brinkmann offers a complete line of Lauda® Integral XT dynamic circulators -- ideal for all types of large-scale research, production, chemical, petrochemical, pharmaceutical, cosmetic, biotech, medical, and other temperature-dependent applications. With temperature control ranging from as low as -90°C to as high as 300°C, these easy-to-use circulators precisely control reactor chemistries and closed-circuit systems. They feature flow rates up to 90 L/min and deliver pressures up to 5.8 bar. 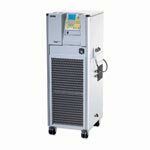 Convenience features include automatic bath liquid degassing and draining mode as well as RS-232/485 connectivity.